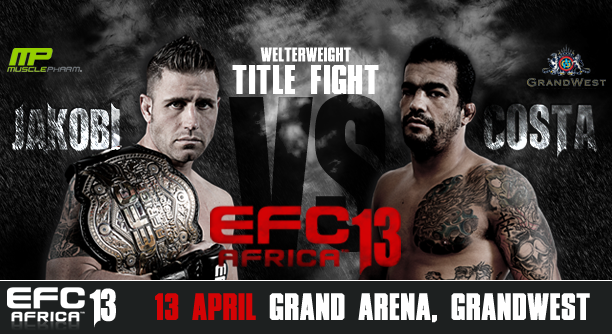 Johannesburg (South Africa) – New bouts have been added to the EFC AFRICA 13 fight card! The card already features 7 tantalising match-ups, with another 5 to be released in the next few days. EFC AFRICA’s first ever Cape Town event promises to be the most spectacular yet! If you can’t make it to the live event, see Africa’s number one MMA extravaganza live at Nu Metro cinemas countrywide! At light heavyweight, Durban knockout machine Dain ‘Sandman’ Neveling takes on former heavyweight champion Norman Wessels. Before making the cut to light heavyweight, Wessels was ranked second in the heavyweight division, having lost the EFC AFRICA heavyweight title in June 2011. Neveling hopes to topple a fearsome opponent in his EFC AFRICA debut, while Wessels looks to make an impact in a new division. At featherweight, Leo Gloss makes his long awaited return to the hexagon. Having gone 5 rounds with the featherweight champ and losing on points in his last fight, Gloss hopes to work his way back to title contention. Opposing him is Abdul Hassan, the most experienced athlete in the division. Hassan also comes off a loss and is raring to prove he belongs among the division’s elite athletes. Also at featherweight, Georgian boxing phenomenon Koba Iakobidze faces Cape Town’s Alain Ilunga. After a closely contested brawl at EFC AFRICA 12, Iakobidze has a point to prove, but will need to get through Ilunga, a K1 kickboxer who has developed a taste for armbars!